“We owe Peter Wege a great debt for his vision of how he wants the world to be and for his tenacity in pursuit of that vision” is the beginning of the dedication in Green Buildings of West Michigan published by US Green Building Council West Michigan in 2010. As an executive at Steelcase, an office furniture company started by his father and two partners, he helped define and align the environmental vision for the international organization. 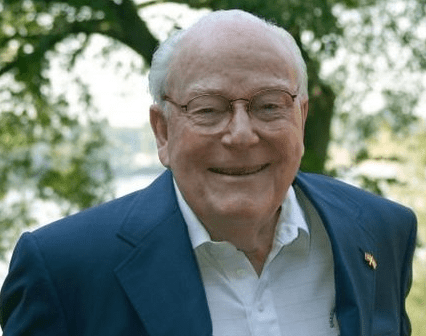 As an activist for clean air and clean water, Peter Wege founded the Center for Environmental Study in Grand Rapids in 1968 – even before the first Earth Day! As a philanthropist, his establishment of The Wege Foundation drove community support and funding for a wide array of environmental causes. The US Green Building Council’s LEED program has been one of those causes. Embracing the principles of economicology, The Wege Foundation was an early adopter of LEED building practices requiring capital projects must seek LEED certification. Many have benefited directly from this far-sighted generosity, capturing and controlling operating costs that result from optimized efficiencies. The Foundation helped spur a generation of designers and contractors with skill sets that have become embedded in their delivery systems. The list of LEED buildings that the Wege Foundation has contributed to is a long list so here is mention of only a few: Grand Rapids Art Museum (first LEED Gold Art Museum), Grand Rapids Ballet, St. Mary’s Wege Institute for Mind, Body and Health, several buildings on Aquinas College’s campus, Kendall College of Art and Design the Wege Center for Sustainable Design, The Cathedral Square Project with the Catholic Diocese of Grand Rapids, and opening soon the new Blandford School within Grand Rapids Public School District. Peter Wege was a true giant. He not only helped to make Grand Rapids the first “City with the most green buildings per capita”, his generosity funded the initial years of operation of USGBC West Michigan. Now the Foundation is supporting the Battle of the Buildings with 11.5 million square feet in competition. Peter Wege’s memorial was July 11, 2014. On behalf of the USGBC West Michigan Board and Members we thank you, Mr. Wege.